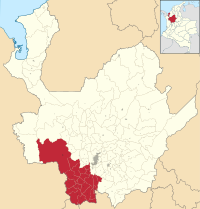 For the district in Peru, see Antioquia District. The Department of Antioquia (Spanish pronunciation: [anˈtjokja]) is one of the 32 departments of Colombia, located in the central northwestern part of Colombia with a narrow section that borders the Caribbean Sea. Most of its territory is mountainous with some valleys, much of which is part of the Andes mountain range. Antioquia has been part of many territorial divisions of former countries created over the present day territory of Colombia, and prior to the Colombian Constitution of 1886, Antioquia State had its own sovereign government. The department covers an area of 63,612 km² (24,427 sq mi), and has a population of 5,819,358 (2006 estimate); 6.6 million (2010 estimate). 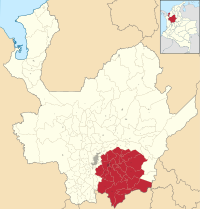 Antioquia borders with the Córdoba Department and the Caribbean Sea to the north, Chocó to the west, to the east it borders the departments of Bolivar, Santander and Boyaca, and to the south the departments of Caldas and Risaralda. Medellín is Antioquia's capital city, and the second-largest city in the country. Other important towns are Santa Fe de Antioquia, the old capital located on the Cauca, and Puerto Berrío on the Magdalena. Antioquia is the sixth-largest Department of Colombia. It is predominantly mountainous, crossed by the Cordillera Central and the Cordillera Occidental of the Andes. The Cordillera Central, further divides to form the Aburrá valley, in which the capital Medellín is located. The Cordillera Central forms the plateaus of Santa Rosa de Osos and Rionegro. 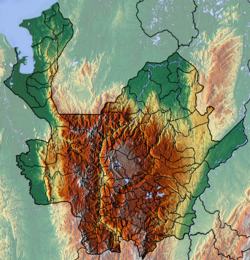 Despite 80% of the department's territory being mountainous, Antioquia also has lowlands in Bajo Cauca, Magdalena Medio, and eastern Sonsón as well as a coast on the Caribbean Sea, in Urabá. This area has a tropical climate and is of high strategical importance due to its location. Before Spanish colonization, a large tribe, the Muisca, inhabited this part of modern Colombia. There is still much uncertainty about the origin of the tribes. Antioquia was primarily populated by Caribs, although some scattered groups of Muisca were present in the Darién region (in modern-day Panama), a coastal region in the far north of Antioquia. However, there are no historical records for these groups of Muisca in Antioquia. The Caribs present in Antioquia were further classified into smaller groups, called families. Some of the most prominent native families in the region include the Catías, Nutabes and Tahamíes, which all inhabited the central region of Antioquia. An important group that inhabited southern Antioquia was the Quimbaya. There were other groups, but the Quimbaya, Carib and Muisca tribes were the most prominent groupings that were found by the conquistadors upon their arrival in Antioquia. The Quimbayas had little to do with the evolution of the department, because Jorge Robledo, the main conquistador of Antioquia, quickly subjected the few Quimbaya that he found and the rest disappeared. The history was centered then in the turbulent relationships of the Spaniards with the Caribs. Despite the number of Caribs and their well-known warring culture, they would end up dominated or exterminated by the Spaniards in the process of conquest and colonization. During these processes bloody confrontations were presented that caused the surviving natives to disperse, and even commit suicide, before they were subjected. Many of the survivors fled to the department of Chocó. Thus, in Antioquia, the natives disappeared almost completely. At present, the autochthon population of the department of Antioquia scarcely reaches 0.5% of the total population. A debate, centered around the apparently significant Jewish origin of Antioquians, took place from mid-nineteenth century to the twentieth century. Others, later pointed to Basque origins as a way to understand the population's idiosyncrasies. Prominent among these, were two American historians: Everett Hagen and Leonard Kasdan. Hagen looked at the telephone directory in Medellin in 1957 and found that 15% of the surnames were of Basque origin, finding then that employers in the percentage of surnames was up to 25%, which led him to conclude that Basque settlers were very important in explaining the increased industrial development of Antioquia in the Colombian context. These ideas were supported by representatives of developmental theories, who sought to justify business growth based on "the character of social groups." The use of Basque language (Euskera) terminology in the present territory of Colombia goes back to the early exploration in 1499, during the third voyage of Columbus, it is said that from that time the territory experienced a strong presence of Basques including prominent figures such as the pilot and geographer Juan de la Cosa, nicknamed "El Vizcaino" (although some sources claim that he was not a native of the Basque Country, but was born in Santoña, Cantabria). Thereafter, the Basques began to come regularly and are distributed throughout the region. Due to this presence, the Colombian department of Antioquia has been considered a major route of the Basque-Navarre emigration, mainly during the colonial era, when hundreds of Basques migrated to be linked to the Spanish colonization companies. People who were interested in investigating the presence of the Basque People in the department of Antioquia and Colombia have been troubled by the question that relates to the use and retention of the Basque language in their current territories. It is estimated, for example, for smaller Antioquia, a region where hundreds of Spaniards arrived, of which a good portion were Basque, some limited aspects of the culture and traditions were brought by Basque settlers, though without any mention of their particular language, thus tracking the use of Basque in the current Antioquia and Colombia. However, this is partly due to the Basque language always having been an outcast, which apparently left no written evidence in Antioquia. In this regard, it is hardly likely that the Spanish crown—in order to maintain the monopoly of overseas companies, to maintain policies that restrict citizens not belonging to the then Spanish rule—would allow its colonies to speak languages other than Spanish. Those Basques invited to participate in the colonization companies, and foreigners in general, had to learn the official language, i.e., Spanish, hence the dominance of Spanish. Despite these restrictions, it is still possible to trace the history of Colombia's present references to the ancient language of the Basques. A reference that has very ancient use of Euskara in Colombian territory, occurred in relation to Lope de Aguirre, a native of Gipuzkoa nicknamed "The Madman". Aguirre's rebellion defied the Spanish empire, carrying out acts against the subjects of the Spanish crown. Pedro de Ursúa, a Navarrese faithful to the Spanish king, who was also the founder of Pamplona in eastern Colombia, said that he could persuade the soldiers to be told of Aguirre's revolt, if they spoke in Euskara. After the Spanish Civil War, many Basque families migrated to Colombia. A number of these families were Basque-speakers and wrote works in Euskara and, likewise, translated from Spanish to Basque literary works of Colombian authors. The current Spanish dialect in Antioquia, closely observed, has obvious influences from Basque. Basque influence is evident in words such as 'ma' (mother), 'coscorria' (useless, inept) and 'tap' (tap), to name only a few cases. Basque also influenced the pronunciation of the letter 's' apico-alveolar (transitional between 's' and 'sh'), so in the Antioquia, and the letter "ll" (double L) pronounced as an affricative, not to overlook the inclusion of the letter "a" before certain initial Rs: arrecostarse instead of recostarse, arrecoger instead of recoger and arrecordarse instead of recordarse. The first Spaniard known to have visited the territory now known as Antioquia was Rodrigo de Bastidas, who explored the area around the future site of Darién in 1500. Ten years later, Alonso de Ojeda founded San Sebastián de Urabá, 2 km from the present-day town of Necoclí, which would be destroyed later by the natives. The first Spanish military incursion into Antioquia, however, was not made until 1537, when an expedition commanded by Francisco César traveled the lands of the Native American chief Dabeiba, arriving at the Cauca River and taking an important treasure from the indigenous people's tombs. In response, the warriors of the chief Nutibara harassed the Spaniards continually, and forced them to return to Urabá. In 1541, the conquistador Jorge Robledo departed from the site of the future (1542) Spanish town of Arma, a little below Aguadas in the south of Antioquia, to lead an expedition north on the Cauca River. Farther north, Robledo would found the city of Santa Fe de Antioquia, which in 1813 was declared the capital of the sovereign and independent state of Antioquia, and remained the seat of the governate until 1826 when Medellin was designated the capital. Other Spaniards who settled Antioquia included Extremadurans, Catalans, Andalusians, and Canarians; the Extremadurans and Catalans also influenced the pronunciation of the letter 's' apico-alveolar, like Basques, and Andalusians and Canarians influenced seseo in the Spanish dialect. The reason behind the chosen name for the department is not historically clear. The most accepted explanation is that the name for the, then Greek-Syrian (now Turkish), Hellenistic city of Antioch on the Orontes (Greek: Antiochia, Αντιοχεία, Arabic: Antākiyyah, today Antakya) was used, as the region known as the Coffee Zone in Colombia, in which many towns and cities are named after cities in the Middle East, has a very strong Judeo-Arabic influence, both demographically and culturally; Additionally the city in mention played a significant role in the development of early Christian communities thus religiously important for Roman Catholic Spaniard conquerors. Others state that it is named after some of the other many Hellenistic ancient cities in the Middle East named Antiochia which were founded as well by some of the Antiochus Kings during the Seleucid Empire (312–63 BC). Due to its geographical isolation (as it is located among mountains), Antioquia suffered supply problems. Its topography did not allow for much agriculture, so Antioquia became dependent upon trade, especially of gold and gin for the colonization of new land, although much of this trade was due to reforms passed after a visit from an inspector of the Spanish crown, Juan Antonio Mon y Velarde in 1785. The Antioquia became colonizers and traders, contributing to the Antioquian culture. The Wall Street Journal and Citi announced in the year 2013 that Medellín, the capital of the Department of Antioquia, is the winner of the City of the Year competition, a global program developed in partnership with the Urban Land Institute to recognize the most innovative urban centers. Medellín beating out finalists Tel Aviv and New York City. The local inhabitants of Antioquia are known as antioqueños. Of the five main regional groups in Colombia, the predominant group in Antioquia are known as paisa, referring to those living in the Paisa Region, which covers most of Antioquia, as well as the departments of Caldas, Risaralda and Quindío. ^ "Government of Antioquia". Gobernación de Antioquia, República de Colombia. Archived from the original on 16 November 2011. ^ Kline, Harvey F. (2012). "Antioquia, Department of". Historical Dictionary of Colombia. Lanham, Maryland: Scarecrow Press. p. 45. ISBN 978-0-8108-7813-6. ^ "DANE". Archived from the original on 13 November 2009. Retrieved 13 February 2013. ^ "Geografía". Gobernación de Antioquia. 17 September 2012. ^ Moreno, Carolina (2 March 2013). "Medellin, Colombia Named 'Innovative City Of The Year' In WSJ And Citi Global Competition". huffingtonpost.com. Retrieved 15 October 2013. ^ "Medellín Voted City of the Year". uli.org. Retrieved 15 October 2013. ^ a b "Antioquia es extensa y diversa". Departamento Administrativo de Planeación, Gobernación de Antioquia, República de Colombia. 27 February 2013. Archived from the original on 12 May 2013. ^ "Reloj de población". DANE. Retrieved 6 July 2017. ^ "Censo General 2005 Perfil Antioquia" (PDF) (in Spanish). Departamento Administrativo Nacional de Estadística (DANE). 13 September 2010. Archived from the original (PDF) on 13 November 2010. Wikimedia Commons has media related to Antioquia Department. Wikisource has the text of the 1911 Encyclopædia Britannica article Antioquia. Wikivoyage has a travel guide for Antioquia.